Vimal Khode is packing lunch and Shrikrishna Khode is preparing his jhola – a jhola that contains a bottle with drinking water, two ghamchas, and a small knife, which he will use to remove the stubborn weeds. They walk for 30 minutes to reach their one acre farm which was lying barren until 6 months back. 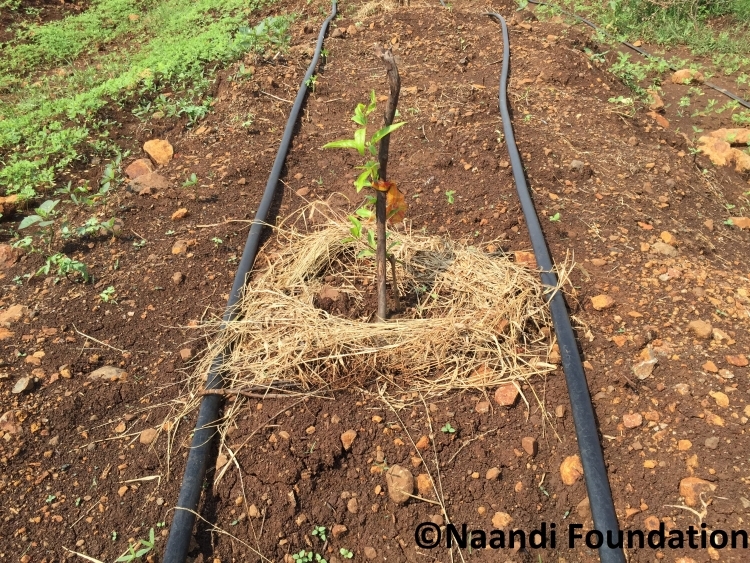 The erstwhile barren land is now planted with 370 pomegranate saplings, installed with drip irrigation equipment, and intercropped with pulses. Shrikrishna and Vimal belong to the village of Vijaygopal, in Wardha district, 100 kms from Nagpur, Maharashtra. It is situated in the heart of the Vidarbha region, a region that is marred by an agrarian crisis. Dependency on cash crops, volatile markets, and droughts are the main contributing factors of the distress in Vidarbha. Farmers were neck-deep in debt and thousands committed suicide, in a desperate measure to avoid paying off these debts. Naandi Foundation, aggrieved by the situation in Vidarbha, decided to step in to help. Naandi has designed a project that employs sustainable cultivation of the horticultural crop, pomegranate. 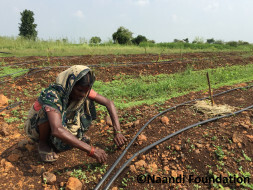 In partnership with Mahindra and Mahindra, Naandi currently works with more than 600 farmer families in 2 talukas of Wardha district, in cultivating high value crops, such as pomegranates. Shrikrishna Khode and his wife Vimal Khode are trailblazers of the project. 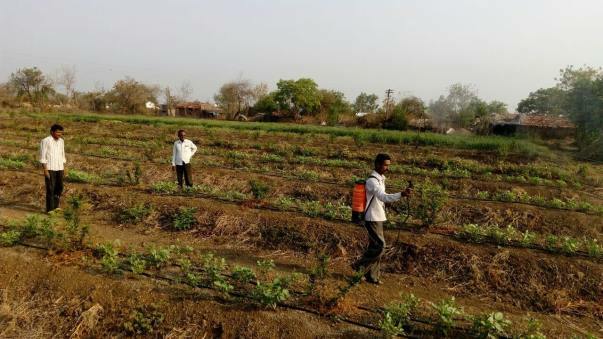 They were the first ones to implement every activity in Vijaygopal – they cleared the land, dug 370 pits of size one feet by one feet, which took a total of 150 man hours, filled the pits with 900 kgs of farm inputs in the specified dosages, planted 370 pomegranate saplings, and intercropped the farm with pulses. Today, they are confident of growing the best fruits in Wardha district. 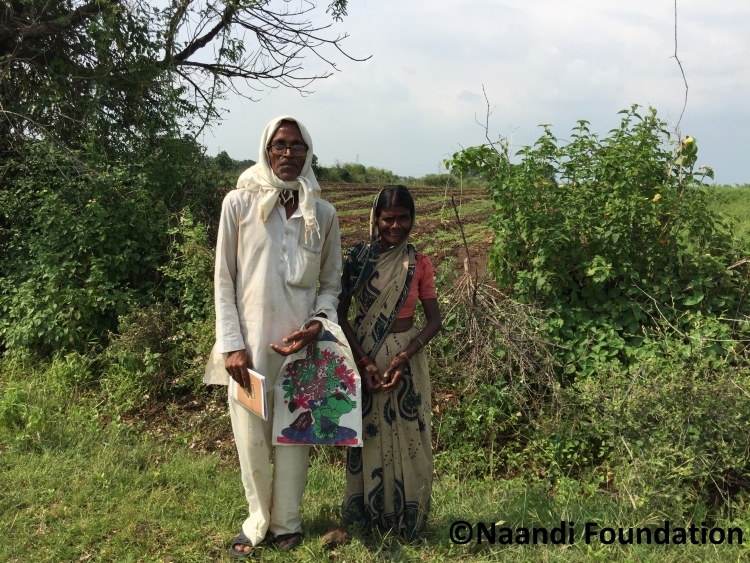 With constant support, expertise and advice from Naandi Foundation, farmers here are able to fight the distressed conditions and not just survive, but thrive and do well for themselves. 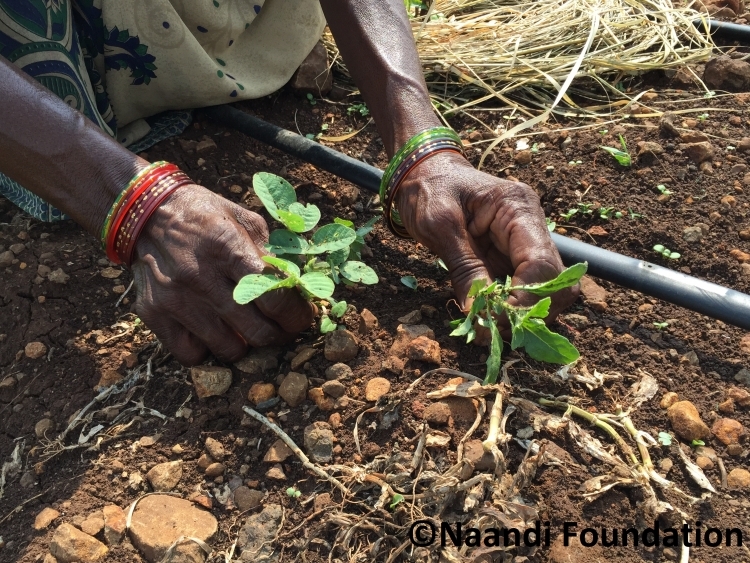 Naandi Foundation ensures that farmers adopt non-chemical farming, best practices of organic cultivation and have access to advisory. Projects such as these are proof that even in the worst of conditions, the right support and advice can turn things around for farmers. 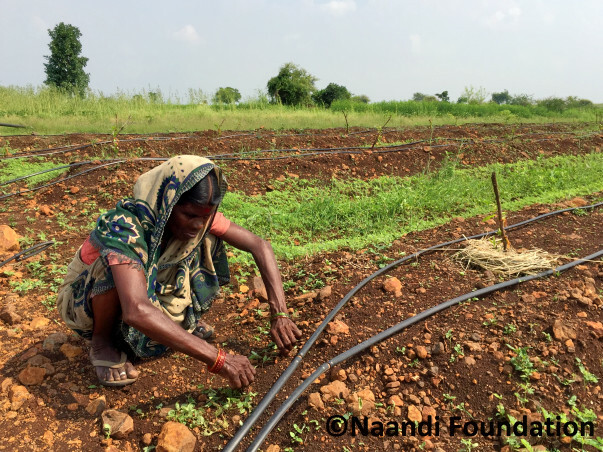 Naandi Foundation aims to help farmers here prepare 1000 acres of market ready, high quality, pomegranate cultivations by 2017, by providing mounding of land and installation of drip irrigation equipment, to top quality saplings and bio-inputs for improving soil health, deterring weeds and pests. You can help in this cause too. Every donation made by you, is matched by Mahindra and Mahindra, creating double the impact. A donation of Rs 500 will work towards creating a viable unit of one acre of horticulture, including the use of earth movers for land preparation, installing drip irrigation equipment along with high quality saplings, and organic inputs for growth of plants (one viable unit = 365 saplings). Two pomegranate saplings will be planted. A donation of Rs 5,000 will work towards creating a viable unit of one acre of horticulture, including the use of earth movers for land preparation, installing drip irrigation equipment along with high quality saplings, and organic inputs for growth of plants (one viable unit = 365 saplings). 20 pomegranate saplings will be planted. A donation of Rs 50,000 will help achieve the vision of the project, which is about transforming the farmer family lives by creating a comprehensive agrarian solution that will deliver sustainable local nutritional security and assured prosperity. Your contribution will help create one acre unit of horticulture which includes the use of earth movers for preparing the land, installing drip irrigation equipment, along with high quality pomegranate saplings. Your support has been tremendous. We can't thank you enough for this help. Here's what we are doing for our farmers. Multiple rounds of discussion with the farmer families and village level meetings were conducted in the villages of Deoli and Samudrapur to introduce the development of bio-dynamically grown pomegranate orchards. In the existing Deoli and Samudrapur talukas, 51 farmer families have been enrolled in April 2016. Mounding work commenced in 51 acres of land from the third week of April 2016. Drip equipment: Work orders have been issued to drip irrigation companies. Technical experts from these companies are currently in the field, conducting surveys and designing the drip layout for each farm followed by installation of equipment. The installation will be completed by June 2016. Pomegranate saplings: Order for 18,816 saplings of pomegranate made and delivery is expected in June 2016. The plantation is planned in July 2016 depending on the monsoons. Boundary and intercrop saplings: Casuarina and Moringa saplings have been ordered to plant on the boundaries. The plantation is planned in July 2016 depending on the monsoons. Biodynamic (BD) inputs: A detailed farm input requirement is prepared in consultation with bio-dynamic agriculture experts and the order for BD inputs has been placed. The application of BD inputs will start from June 2016 every month until March 2017.